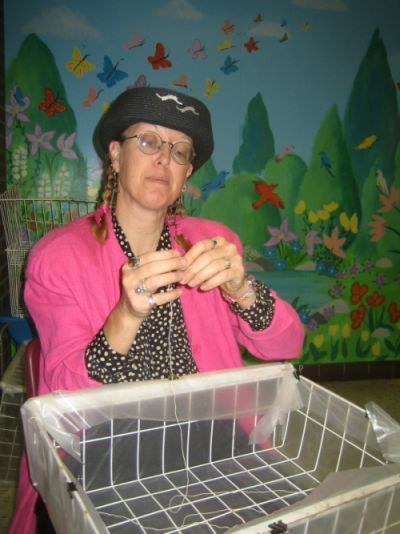 Welcome to our Donations: Giving and Receiving page! please see the second half of this page. Donors to our garden are listed below, at this link. Riverdale Meadow Community Garden regularly engages with the broader gardening community, farmers' markets, and our local neighbourhood's residents and businesses. We do this partly through donating and trading perennial food plants and Ontario Native Species shrubs and wildflowers with other community gardens across the city; and partly by offering workshops and tours, as well as participating in Seedy Saturday events across Southwestern Ontario and local organic farmers' markets. We also invite those in our neighbourhood, who live in apartments and have no other place to recycle their fruit and vegetable scraps, to bring their compostables to the garden. Additionally, we donate fresh organic produce, from spring through fall, to the kitchen of a local mental health centre. A list of perennials available to other community gardens is posted at the bottom of the Donating To Others portion of this page. for an example of donations of fresh organic produce made by our gardeners to the kitchens of local crisis centres every year, inspired by the national Plant A Row ~ Grow A Row program. These strawberry plants were donated to a local public school's Learning Garden, from a Riverdale Meadow Community Garden member's own plot. Eager children just can't wait for the fruits to ripen fully before picking. 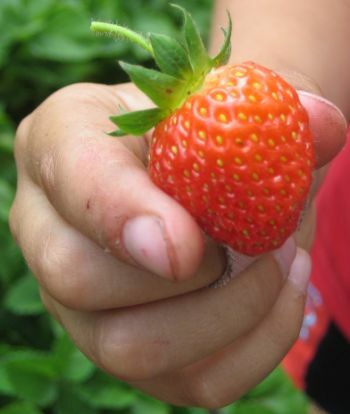 Members of Riverdale Meadow Community Garden delight in reliving their own childhoods by teaching youngsters the pleasures of discovering and tasting fruits fresh from the plant. 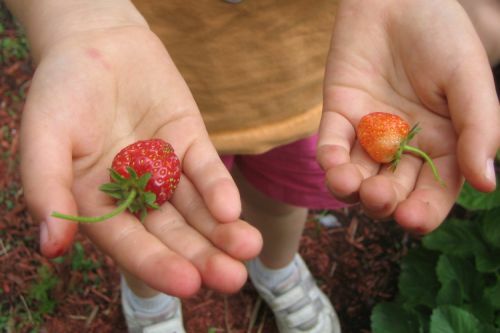 Donating edible perennials to other community gardens is a regular practice. These berry plants are at Jackman Public School, donated in Spring 2006. In 2005 a quantity of plants were donated to the Gerstein Centre, among other locations. This year, plants are already organized for donation to Frankland Community School, as well as offers being made to other city-wide community gardens. 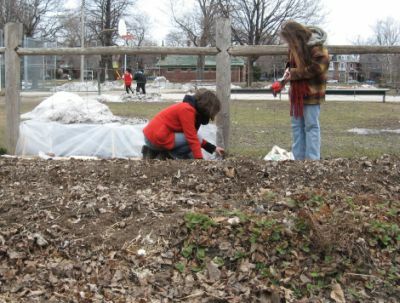 Helping set up experimental ColdFrames at Dufferin Grove Park. Even though the forecast calls for one more late-season snowfall in the coming week, we're optimistic enough to show how to plant peas under a makeshift shelter. In the foreground are strawberry plants donated in 2005, showing the first signs of garden green. Riverdale Meadow C.G. lends a hand in learning to give early crops an extra head-start by applying simple ColdFraming. Here Mammoth Melting Peas are sheltered from wind and a forecasted late snow, and the sun is given an extra opportunity to warm the soil under the wood and plastic. Right foreground: a baby asparagus plant, grown from Riverdale Meadow C.G. seed, and donated to Dufferin Grove Park last year, shows a few wispy beige strands. Asparagus takes patience: planted in 2006, spears cannot be harvested until 2010. By then, the fist-sized root crown will have grown to the size of a watemelon. Peas, asparagus, and strawberries are among the earliest crops to grow and harvest in any garden, giving hope for all the delicious foods to come over the warmer months. Getting into the soil early creates a special sense of bonding among gardeners as we re-emerge from winter cocoons and dreamy hours spent drooling over seed catalogues, to get literally grounded, encouraging dirt under our nails once again. In case you keep track of these things, all 8 kindergarten classes, Ms. Simon's 2/3 and Mrs Plytas Gr. 2 received received a tasty looking baggy of fresh and fabulous Jackman lettuce. I think the cold frame is a hit. It sure is fun to harvest in the spring! 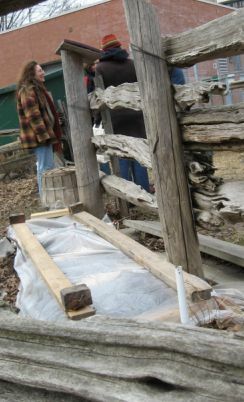 Kyla and Zora, Wanted you to know about the success of the Mache in the cold frames. Thank you both so much for orchestrating this project! As you can see from Robin's note there was an abundant and lush looking harvest. Kyla, are you giving more workshops on the subject? Raspberry Cane on roots (Nova variety, July bearing; sometimes bears again in November) available to transplant as soon as the ground thaws (~ early April). Ensure that your garden beds are prepared ahead for the transplants. Arrive punctually, rain or shine. We have tools, and re-used plastic soil bags for packaging. You and your helpers do the digging; while smiling, and singing or whistling while you work. Provide your own transportation for carting away the plants. While garden receives tap water in summer via TDSB's City Adult Learning Centre, we do not have any paid staff, formal programming, nor official funding. All activities at the garden are member-volunteer initiated and achieved. !! !Donations of goods and services go a long way in helping us keep the garden vital. While we are grateful to receive donations, please contact our coordinators first, to make delivery arrangements. Never just drop things off. Thank you. In order to preserve our fabulous raspberry vinaigrette, the use of a commercial kitchen for about four hours would be tremendously helpful. We sell our popular vinaigrette at fall harvest festivals to help raise funds to keep the garden going. All we need is to boil some water or use a dishwasher to sterilize the commercial-grade bottles, and some table space. We can provide all our own utensils and other materials, and will leave your kitchen cleaner than we found it. We'll even offer up some of the garden's (local, organic) produce to sweeten the deal. Because this garden operates without funding or paid staff, we are grateful to those who can support us in any way. Pre-arranged donations are most appreciated. Our Wish List is posted at the bottom of this page. Please do not just drop things off: contact us first. Thank you. Again, please do not drop off any items without having contacted us first. Thank you for your thoughtfulness and support. Because we participate in the national Plant A Row ~ Grow A Row program, your donations help us make donations in turn, of fresh organic produce, to the kitchen of a local crisis centre. Please, do not deliver any donations to the garden without first contacting the coordinators. Thank you. Again, please do not, ever, drop off any items without having contacted us first. Thank you for your thoughtfulness and support. so thank you for your patience. In April 1993 the Toronto Board of Education granted a space of 50' x 50' to a collaborative effort begun by Dalton Shipway of Bring Back The Don. That group included Karl Eder, then principal of CALC; Pam McConnell, then the local Board of Education Trustee; Sean Cosgrove of the Toronto Food Policy Council; Grow T.O. (now FoodShare, and a driving force behind the Toronto Community Gardens Network); and David Stonehouse, Task Force staff with the City Planning Department. The garden was initiated as a Land Reclamation Project (LRP), a term used specifically to denote the project as being established with a continuance perspective of fifty years and beyond. There are two components to this: LRP-gardening and LRP-naturalization. The naturalization began that fall in partnership with the Landscape Architect's Association. It includes a variety of Ontario Native Species plants, transplanted from Ecology Park when the TTC resumed active use of this Spadina Avenue property. These plants included the wildflowers New England Aster, Small White Aster, Blue False Indigo, Tall Coreopsis, Purple Coneflower, Common Wild Strawberry, Shrubby St. John's Wort, Wild Bergamot, Shrubby Cinquefoil, Gray-headed Coneflower, Sweet Coneflower, Cup-Plant, Prairie Dock, Solomon's Seal, Herb-Robert Geranium. Virginia Creeper and Wild Grape vines were also planted. The shrubs and bushes planted were Red Currant, White Currant, Purple Flowering Raspberry, Blackberry, Blue False Indigo Gray Dogwood and Red Oiser Dogwood. Red Mulberry, Saskatoon Serviceberry, Apple, Choke Cherry, Red Bud Pin Cherry and Eastern White Cedar trees were also planted. A wide variety of herbs were also planted: Yarrow, Chives, Horseradish, Southernwood, Absinthe Wormwood, Costmary, Daylilies, Lavender, Lovage, Lemon Balm, Peppermint, Applemint, Dwarf Catnip, Golden Oregano, Oregano, Santolina, Comfrey, Thyme, and Valerian. The LRP programs under which this land was granted intends Riverdale Meadow Community Garden to be a demonstration garden of indigenous plants and urban farming practices, in order to show the viability of community gardens and ecological restoration in the urban environment. RMCG members commit to the continuance of these goals. This year we received gorgeous wooden boxes for storing and merchandising tubers, seeds, and drying catnip; as well as heavy-duty wheelbarrows, and many much-needed large tools; a significant quantity of plexiglass (delivered, even! ); T-Bars for fencing repairs; wooden framing and stairs; pots and soil; the use of a commercial kitchen to produce our fabulous Raspberry Apple-Cider vinegar; a cash donation from New York Cafe's Halloween party fundraiser; a significant quantity of prime-quality paving stones; volunteer time from a kind neighbour to help us develop Mothers' Garden, by planting the most difficult, thorn-bearing black-cap raspberries; and a much-needed bike rack. Thanks, too, to Withrow Park Farmers' Market, The Brickworks Farmers' Market, and Trinity Bellwoods Farmers' Market for allowing us to share in their festivals and special events. This year we received untreated wood, gardening hand tools, clay pots, storage bins, plant pots, terracing materials, topsoil, worm compost, infrastructure supports, coldframing materials, original music and video editing skills, the use of a commercially licensed kitchen for preparing our fabulous Raspberry Apple-Cider Vinegar, and a pair of huge, heavy concrete planters. Thanks, too, to Withrow Park Farmers' Market, for allowing us to share in their Spring & Fall festivals. This year we received leather work gloves, heirloom tomato plants, paper, fabric, ties, labels, video editing and music, hardwood offcuts, patio stones, buckets for storage, a gift certificate to a garden centre, plant pots, wildflower and vegetable seeds, theatre tickets for a raffle, coroplast for a greenhouse, metal sign frames, and window security bars that will help us build frames for solar ovens. and for your imagination and generous support of our garden. Return to top receiving donations section, this page; and menu for other pages click here.